The game has been remade as Avernum: Escape from the Pit. Original Mac OS version is not compatible with OS X 10.7 (Lion) and later; use the Wineskin port. OS X 10.7 and later not supported. Download ToArrows utility (registration required). Incompatibility with newest MacBooks with the GMA X3100 graphics chip (not present in GOG.com version). Inability to dismount from a horse or move after climbing ladder while on horseback. Solution: Requesting a new key. Avernum might not run properly on newer Macintoshes and trying to run the game/installer will give an error. This problem is caused by the name of the program not ending in .app. Close other programs before running. Turn off Sounds in the Preferences window. (Windows) Turn on XP compatibility mode. (Mac OS) Give the game more memory. To do this, in the Finder, click on the game and press Command-I. (Mac OS) Play the game with a minimal set of extensions. To do this, Restart your Mac, and hold the shift key down while it boots up. You will need to also use the Extensions Manager control panel to turn off all extensions but DrawSprocketLib. 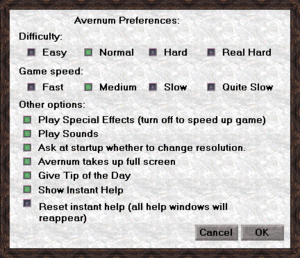 Macintosh: Throw away the "Avernum Prefs" file in the Preferences folder. Windows: Delete the "Avernum.dat" file in the Avernum Data folder. Open the Install file. A window will open with the game art and an installer with the game icon. Drag this installer onto your desktop. Use the Wineskin port instead. If you want to play the game with the same key, transfer the "avernum.dat" file (Windows) in Data folder or "Avernum Prefs" (Mac OS) in Preferences folder (inside the Systems folder on your hard drive) to a safe place. ↑ Spiderweb Forums - Installing Macintosh Games From CD: "Requires admin privileges to run.